Tuesday, February 12 -- The Visalia KOA was a good choice for a quick overnight stay. 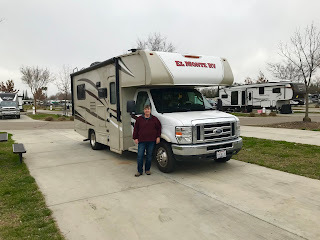 We got an early start for our 345 mile drive north to the Durango RV Resort in Red Bluff. We will wait there for an opening in the snowy weather to cross the mountainous pass from Northern California to Oregon. 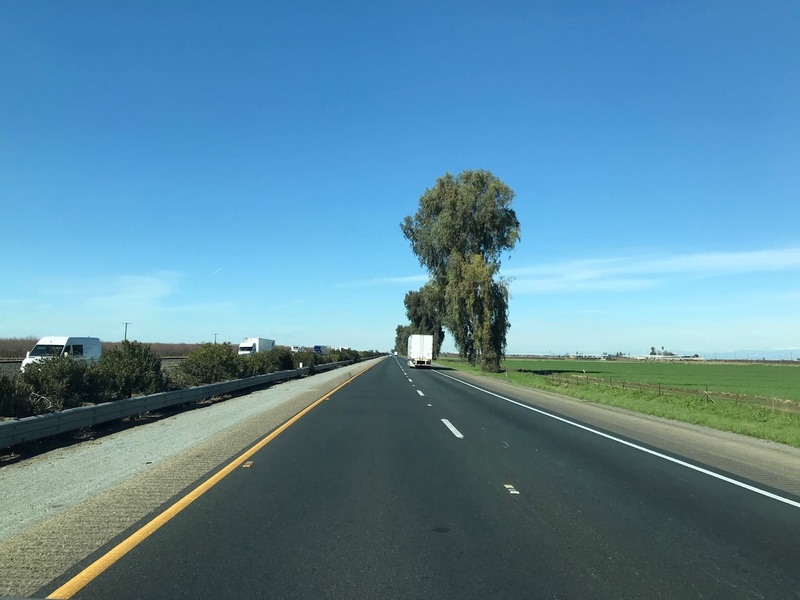 Highway 99 in the Central Valley no longer goes through towns. Highway 99 is more scenic than I-5 on the western side of California's Central Valley, and a blue sky only added to the mood. There were green fields everywhere: hay, vegetables, rice, and groves of olives, nuts and fruit trees. There used to be lots of cotton, but I didn't see any. 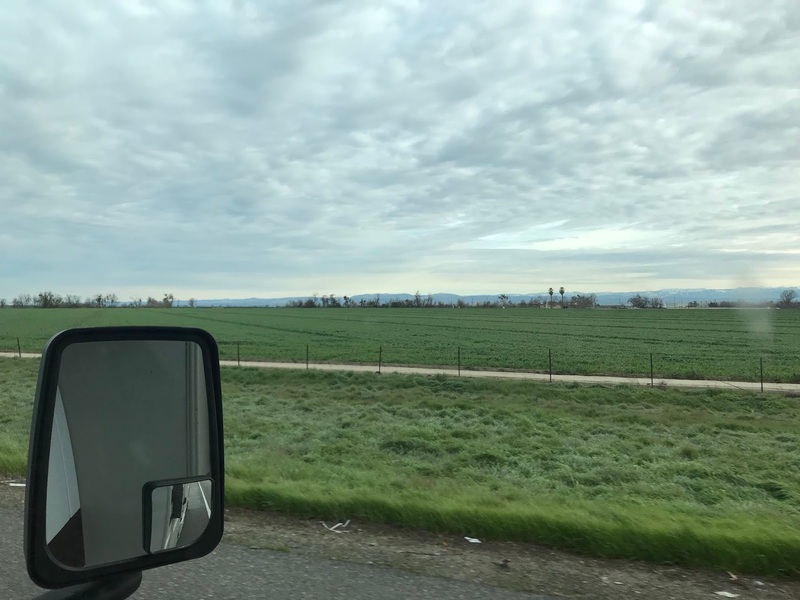 Lush green fields along Highway 99 with rain clouds looming. 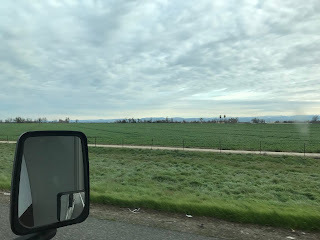 We stopped for gas in Turlock, the place where, as a kid, we turned off to head for my grandparents in Waterford. Turlock sure has grown since the 60s. When I was a teen I took my Mustang to cruise 10th Street in nearby Modesto. Have you ever watched the movie America Graffiti? It was filmed in Modesto, and it was really like that back in my day. 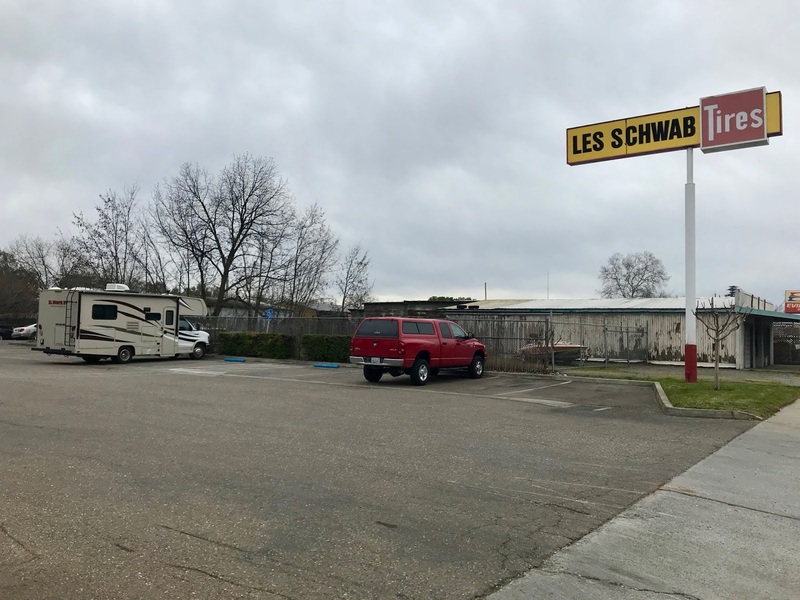 Our rental RV getting new wipers at Les Schwab. 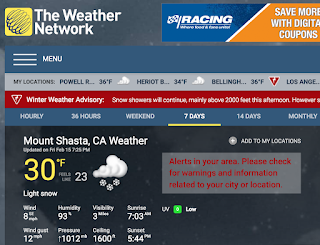 We stopped at Les Schwab in Red Bluff to get new wiper blades. On TV, Les Schwab commercials tell stories about travelers who've had excellent service. That's what we had. We dropped in, asked for the blades, and got them install on the spot. We were in and out in less than twenty minutes. 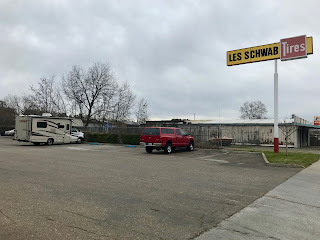 Thanks Les Schwab for "saving" our rental RV adventure. Wednesday, February 13 -- This is the second time we've stayed at the Durango RV Resort. The first was on our trip south. We knew it would be a good place for an extended stay with a Shari's restaurant and grocery store within walking distance. Our spot at the Durango RV Resort before the rain started. It rained both days. That meant it snowed heavily in the high country. 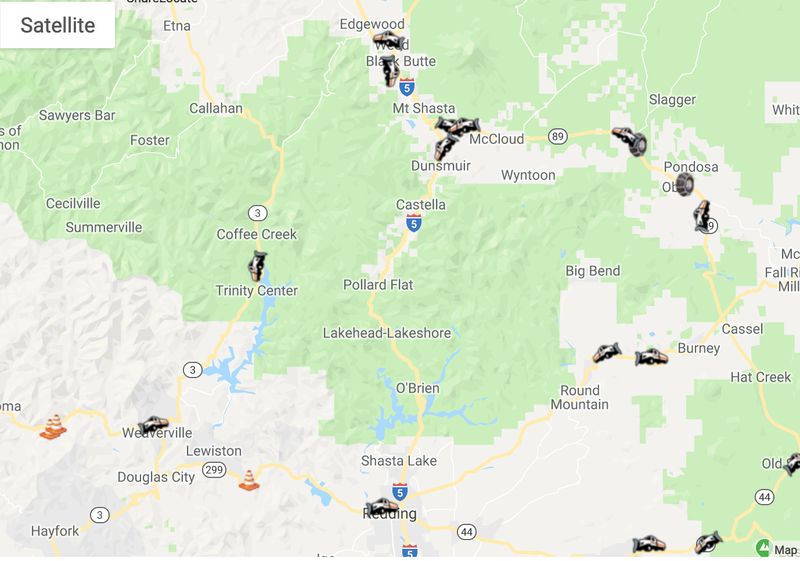 We continually followed weather and road condition reports. Our resources were the CalTrans Road Conditions website, their QuickMap (available as an iPad app) and their Twitter account. The QuickMap covers the whole state, but each region has their own Twitter and Facebook accounts. 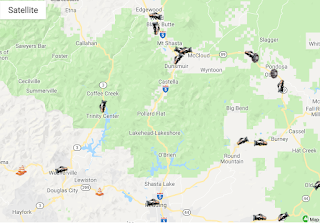 The QuickMap showing snow plows and chain requirements. To follow the weather, our favourite website (and app) is The Weather Network. We save several locations and monitor what's happening in real time. A screen shot for Mt. Shasta on I-5. Love the adventures - and the memories of the places you visit. We do miss California - but maybe what we miss is the California that "was", we first moved there in 1978 (though I was born in CA and lived there until age 6). Enjoy the wonderful scenery for us - we do miss it.